Version 10.2 of the ionCube PHP Encoder for software protection makes it easy to protect PHP source code from easy observation, theft and change by compiling to bytecode. PHP licensing features built into the Pro and Cerberus editions also allow licensing PHP scripts to control where PHP code runs, and files can also have a time expiry. Non-PHP code such as XML can also be encrypted. Three editions of the ionCube PHP Encoder (Basic, Pro and Cerberus) all offer compiled PHP encoding using obfuscated bytecode, plus optional encryption of non-PHP files. Pro and Cerberus also include PHP licensing features for time expiry and restricting where code can be used, allowing licensing models to be effectively and easily implemented. The PHP Encoder is available for Windows, Linux, FreeBSD and OS X. The Windows and OS X Encoders come with a powerful and easy to use GUI, and all editions also include command line Encoders for easy automation. The Pro and Cerberus Encoders also include tools for license file creation. ionCube Encoded files run on a wide range of operating systems including Linux, Windows, FreeBSD and others, and PHP versions up to PHP 7.3. Support for other platforms is available on request. Version 10.2 includes Dynamic and External Keys which offer the greatest level of protection for compiled bytecode. PHP scripts can be easily read, changed and run on any PHP enabled system. Encoding PHP offers important benefits. Product Developers: protect and license your code before distribution. Time restricting is ideal for protecting evaluation copies, and server/domain based locking helps secure revenue from multiple domain deployments. Website Designers: protect your creative work and a revenue stream from future script updates. Enterprise Customers: successfully enforce internal change control policies by avoiding untracked software tweaks that may get lost on a site reinstall or server move. Website Owners: hide sensitive data and protect scripts from unauthorised changes that may go unnoticed indefinitely, and be a serious security and data protection risk. Which Encoder do I Need? The following guide will help you choose the right Encoder edition for your needs. Pro and Cerberus provide PHP encoding plus the ability to create license files for your products. License files can protect your scripts against unauthorised use by locking to specific machines. They can also time expire, which is ideal for releasing evaluation versions. The Windows Pro or Cerberus Encoder also comes with a license generator for Linux, which may be useful for automating license generation from a web server. As a designer, you may wish to provide early versions of your work to the client before completion. You want the code to run, but not forever. Pro and Cerberus allow you protect your files to expire at some point in the future, allowing clients to try protected code for a limited time. The main requirement is likely to be code protection, and the basic version is sufficient for this task. If you would also like to lock files to their intended server, then Pro and Cerberus allow this. Your website files are likely to be specific just to your needs, and so the main requirement is encoding. The Basic version offers this, while Pro or Cerberus would reduce the risk of any stolen files being run on another server. Please view our product comparison for a summary and pricing. Copyright 2002-2019 ionCube Ltd. VAT GB-814942816. All rights reserved. 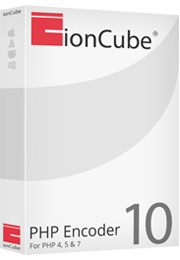 ionCube and the ionCube logo are registered trademarks of ionCube Ltd.
Prices exclude VAT. VAT is applied if purchasing from the UK or from the European Union by a non-business customer. The shopping cart will show any VAT due based on your country before the purchase is finalized.